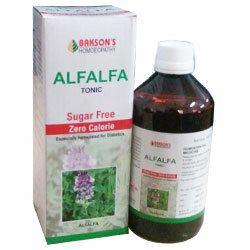 Buy Bakson's Homeopathy Alfalfa Tonic - Sugar Free - Zero Calorie - Especially formulated for Diabetics. Helps relieve loos of appetite, fatique due to anxiety, worry and overwork. Alfalfa has been cultivated suince ancient times and used for its excellent properties of improving the appetite and health in general. Bakson's Homoeopathy brings you Bakson Alfalfa Tonic with the natural goodness of Alfalfa along with other proven homoeopathic medicines. Stimulates the appetite and improve digestion. Fights fatiguewhich results from intense physical exertion, emotional stress or lack of rest. Stimulates and tones-up the nervous system specially during periods of emotional stress when heavy demands cause nervous exhaustion, disturbed sleep etc. It tones up the kidneys and improves its functions thereby making person body's waste disposal more effective. Bakson Alfalfa Tonic efficiently supports the health of a normal person and facilitates convalescence following debilitating diseases. A general tonic which helps relieve loss of appetite, fatigue due to anxiety, worry and overwork. Efficacious in Anemia and convalescence. Adults : 1 tablespoon, three times a day before meals. Children : 1 teaspoon, three times a day before meals. Or as prescribed by the physician. For best results take Alfalfa Tonic With Water.